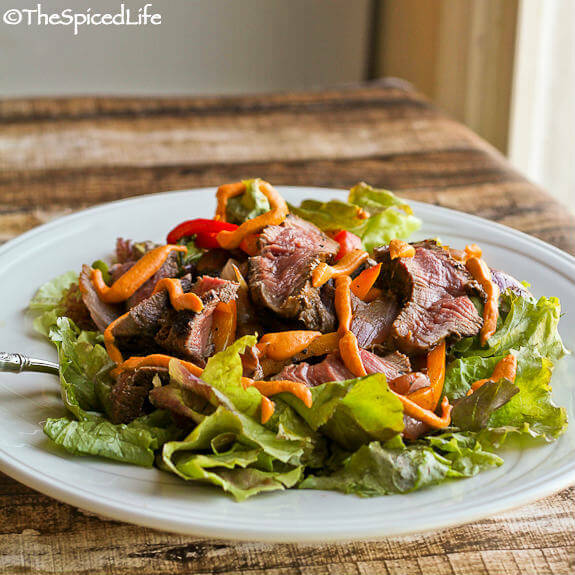 Marinated steak is grilled to perfection and served over greens with roasted peppers and onions. 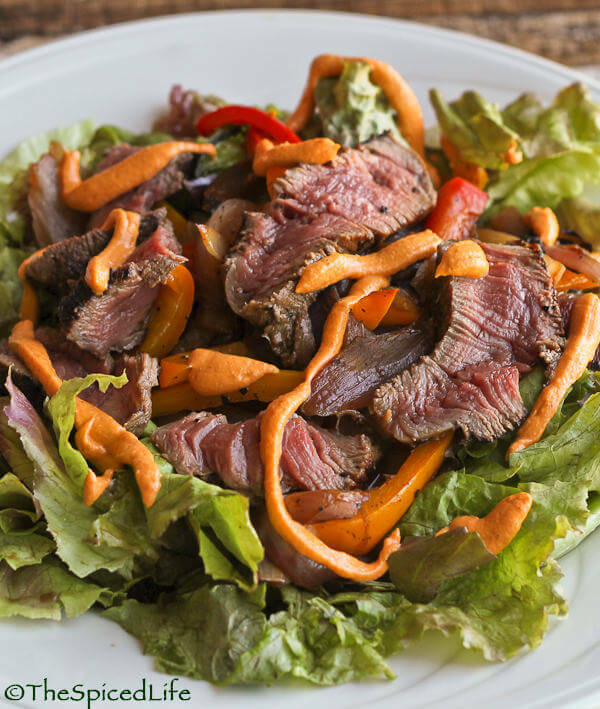 A tangy Romesco dressing ties it all together. Affiliate links were used in this post to link to items I am discussing. I would not normally post about recipes from the same cookbook 2 posts in a row, but this cookbook was that inspiring. We had a houseguest for the weekend, and I made dinner from Good for You (Williams-Sonoma): Easy, Healthy Recipes for Every Day both nights! 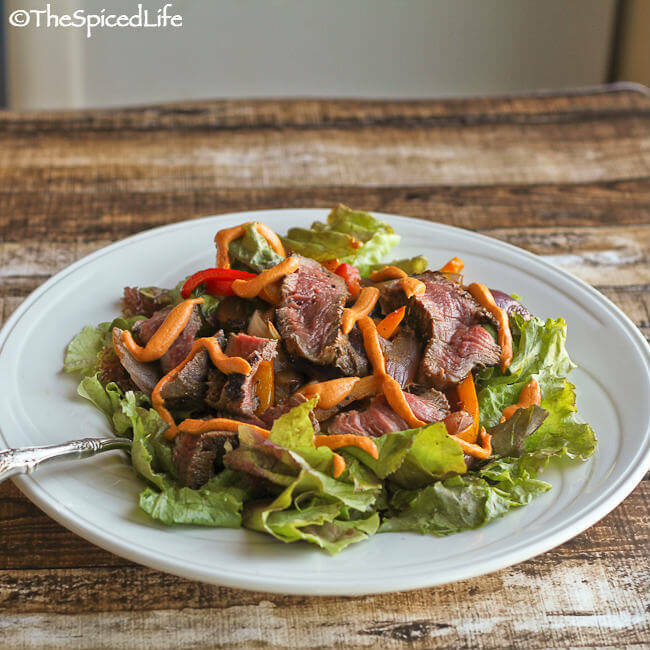 First the Fish over Roasted Fruit, and then this steak salad. Both were huge hits. This is a great dish for the warmer days of fall. It is a salad, and could be done completely on the grill if you choose. Something about the Spanish inspired flavors of smoked paprika, orange, sherry and almonds says fall to me more than summer, but truthfully this would be fantastic any time of year. As mentioned, we had a houseguest, and John could not find any skirt or flank steak at the farmer’s market (my “first” choices) so I decided to splurge and pull a piece of beef tenderloin out of the freezer. Please do not feel you have to go to those lengths to make this a great dish! Skirt, flank, sirloin… all those cuts will work fine, but be sure to cut against the grain for the tougher choices. Likewise I made lots of substitutions and changes to this dish for what I had around. For example, lacking sherry vinegar, I used white wine vinegar and some Spanish sherry. I skipped the flat leaf parsley since I had none. My almonds were raw, not blanched. Etcetera. The salad was devoured by all–even Sammy, whose meat always has to be cooked to medium well (I pretend I didn’t do it!) and who does not like steak that much under normal circumstances. Adapted from Dana Jacobi; makes 6 salads. Whisk together ¼ cup of the extra virgin olive oil with the vinegar, sherry, orange juice, paprika, garlic and oregano. Place the beef in a large ziplock bag and add the marinade. Seal the bag and massage the marinade into the beef. Place in the fridge for at least 2 hours and preferably overnight (I did overnight). When you are ready cook, preheat the oven to 450 F. Toss the peppers and onions with 1-2 tablespoons of extra virgin olive oil. Lay the peppers and onions on a rimmed cookie sheet in a single layer. Sprinkle with salt and pepper. Roast until charring at the edges and softened, about 15 minutes. Remove from the oven and set aside. Heat either your grill or grill pan (I used a grill pan on the cooktop). Remove the meat from the marinade and pat it dry. Sprinkle with salt and pepper. Oil your grill if it needs it (mine is seasoned cast iron and does not). Grill your steak to desired doneness–for me that is always as rare as possible. This will probably take between 10 and 15 minutes, including flipping once. Remove to a wooden cutting board and let the meat rest. Assemble the salads by placing a mix of both lettuces in each bowl or plate, followed by the roasted peppers and onions. Prepare the Romesco dressing (see below). When you are ready to serve, slice the steak. Be sure to slice against the grain for anything other than tenderloin, where it does not really matter. Divide the steak between the plates. The dressing is thick and creamy–I chose to use a plastic bag with the corner snipped to “drizzle” it over each salad. 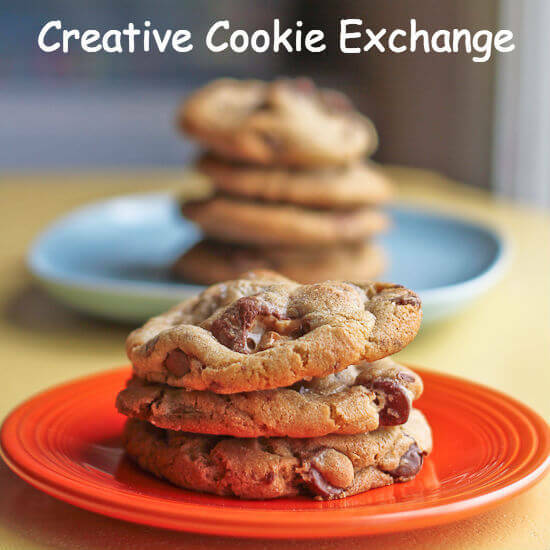 Adapted from Dana Jacobi; I found this recipe to be very much to taste–be prepared to add more of any of the ingredients if you feel like it needs it. As long as you have a grill ready, grill the garlic cloves. If you do not, you could also dry toast them in a skillet–this is just to take the edge off of the raw garlic. Place the grilled garlic cloves, peeled, into a food processor. Add the orange juice, vinegar and sherry and puree smooth. Add the paprika, piquillo peppers and almonds and puree smooth again. With the food processor running, add the olive oil in a stream. It will become quite creamy as it emulsifies. Add a pinch of salt and pepper. Taste for more of any of these ingredients. I like to scrape this dressing into a ziplock bag and snip the corner off of it and squeeze the dressing out that way. It is really too thick to dollop in an attractive way! You must really love this cookbook if you’re posting from it twice in a row! I don’t blame you…the flavors in this salad sound great! that looks delicious, so colorful, thanks for sharing this recipe.